The Computing Community Consortium (CCC) has attended and hosted sessions at the American Association for the Advancement of Science (AAAS) Annual Meeting since 2013. AAAS is the world’s largest multidisciplinary scientific society dedicated to advancing science for the benefit of all people. 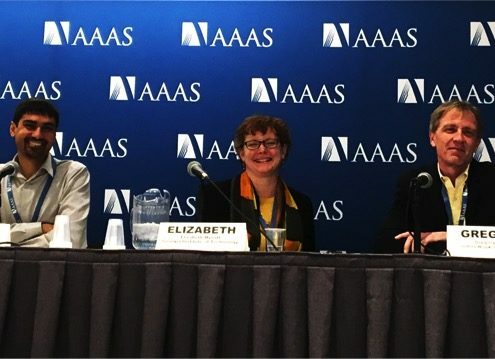 CCC Council Members Shwetak Patel (Washington), Elizabeth Mynatt (Georgia Tech), and Greg Hager (Johns Hopkins) at the 2017 AAAS annual meeting. Below you can find information about CCC participation during each year and links to slides, resources, and related CCC white papers. To learn more about the AAAS Meeting visit the webpage for past and future meetings. To learn more about these three sessions and to find related resources visit the 2019 CCC at AAAS page. To learn more about these three sessions and to find related resources visit the 2018 CCC at AAAS page. To learn more about these three sessions and to find related resources visit the 2017 CCC at AAAS page. In 2016 the CCC hosted one scientific session on The Confluence of Computing and Society: Emerging Themes in Socio-Technical Systems. To learn more about this sessions and to find related resources visit the 2016 CCC at AAAS page. In 2013 the CCC hosted one scientific session on How Fundamental Computing Research Touches Everyday Lives. To learn more about this sessions and to find related resources visit the 2013 CCC at AAAS page.